Chief Gibby Jacob (Squamish Nation), Tamara Davidson (Aboriginal Affairs and Northern Development Canada), Councillor Chris Lewis (Squamish Nation) and Marion Robinson (FBC) at the 2011 Province-Wide Community to Community Forum in North Vancouver, hosted by the Union of BC Municipalities and First Nations Summit. First Nations are among the signatories to the Charter for Sustainability and have participated on the Fraser Basin Council board since the Council was established in 1997. Eight Aboriginal Directors from across the Fraser Basin sit on the board with local, provincial and federal government representatives, and with representatives from the private sector and civil society. We recognize that Aboriginal nations within the Fraser Basin assert Aboriginal rights and title. These rights and title now being defined must be acknowledged and reconciled in a just and fair manner. FBC hosts a Suxwtxtem Committee, which gives strategic advice to the Board of Directors on improving Aboriginal/Non-Aboriginal relationships and advancing the aim of Principle 11. Suxwtxtem is an Okanagan word that means to sustain the diversity of species and habitat in perpetuity for future generations. It speaks to the longstanding commitment of First Nations to sustainability. FBC’s partnership programs have emphasized meaningful engagement with First Nations. These include, for example, Smart Planning for Communities, Remote Community Implementation (clean energy solutions), and Fraser Salmon and Watersheds. In the regions, FBC works on a variety of partnership projects. We have, for example, facilitated First Nations meetings on economic development planning (Fraser Valley and Thompson), hosted Aboriginal economic development forums (Cariboo) and coordinated Aboriginal youth projects on watersheds and air quality (Upper Fraser). When it comes to building strong, respectful relations between Aboriginal and Non-Aboriginal people, leaders play an important role. Community to Community (C2C) Forums are a joint initiative of the Union of BC Municipalities and First Nations Summit. 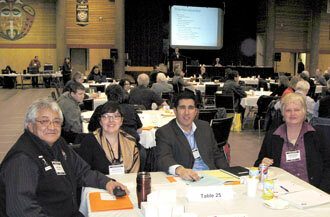 In a forum, First Nations and local governments meet to discuss common goals and opportunities for joint action. On several occasions, FBC staff have been asked to facilitate the forums or host other similar dialogues — an opportunity we welcome. We also sometimes work with regional and municipal governments to help develop a better understanding of First Nations and good working relationships. 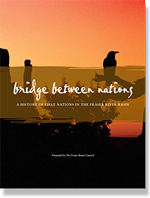 Bridge Between Nations is a popular FBC publication that focuses on First Nations of the Fraser Basin — with an overview on history, language and culture, and key events that have shaped Aboriginal/Non-Aboriginal relations. Are you interested in building bridges, in forging stronger relationships? Consider opportunities for Aboriginal and non-Aboriginal communities to come together where you live and work. That might include planning a local celebration or dialogue, or taking part in Aboriginal cultural tours and activities. If you are a local government or First Nations leader, it may mean participating in a Community to Community forum or similar event.